At Taste The Cracklin we offer a wide range of hog roast services which are suitable for any event. When it comes to finding the perfect catering option we offer a range of different menus to suit formal and informal occasions. 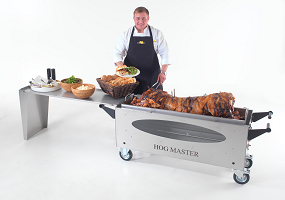 Catering is an important part of any occasion, so why not choose a hog roast? Wicklow has a number of different catering services available but nothing will beat our excellent food and service. We can make your wedding one to remember with our delicious formal meal setting, or we can provide an informal buffet, no matter what your needs are we can provide an excellent menu. Our hog roast is the perfect solution for catering when you are planning an outdoor event because even if the weather decides it is not playing along, a hog roast can be moved inside and provide you with your menu. When it comes to finding the right hog roast Wicklow can provide you with our expert services, our succulent hog roasts are the perfect form of catering. You never need to worry about your catering when you hire our services, our expert chefs will ensure that you have the very best food which your guests will love. When you’re ready to learn more about how we can help you cater your next event, wedding or party. By all means give us a call, or send us a message through the website and we’ll happily explain to you how we can best help you.